A part of traditional Old Ephraim, our two cottages have white clapboard siding and old-fashioned screened porches typifying the simple charm and relaxed beauty of the older buildings of the Village. Guests enjoy the use of a private sand beach located directly across the highway from the cottages. 2019 Rates: $875 per week; $125-$140 per day. 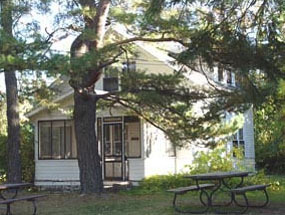 Located toward the south end of Ephraim and within walking distance of the Peninsula State Golf Course, the cottages are removed from the congestion of the center of the Village, yet are less than a mile away from such spots as the library, Wilson’s, the Post Office, etc. 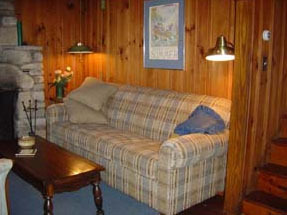 Guests enjoy the use of a private sand beach located directly across the street from the cottages. The sandy bottom slopes very gradually toward deeper water, creating a pleasant swimming area for all. Both cottages have a microwave oven, gas range, refrigerator, the necessary cooking and serving equipment, TV (Cable), VCR, DVD and WIFI. No telephone service is available. Bedspreads, blankets and pillows are furnished. 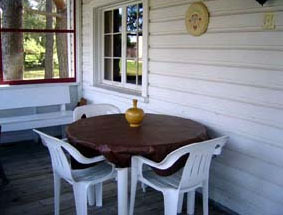 Although linens and towels are not generally provided they can be furnished for a modest fee with advance request. A baby crib and high chair is available upon prior notification. Charcoal kettle grills are provided. Cats and dogs are allowed upon payment of a $30.00 per pet per occupancy period. Pet owners are advised that Ephraim ordinances require a dog be leashed when outside. Weekly rates: 1-6 people - $825.00. Each person over 6 - $140. 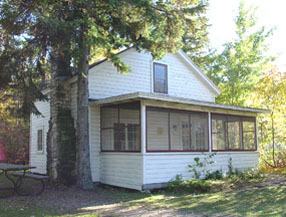 Spruce Cottage - Ephraim Fire No. 9846. Fireplace; gas wall heater; bath with shower only; one ground floor bedroom with queen bed; two second floor bedrooms, one with single bed, one with double bed, single bed and sofa pullout bed. A rollaway bed is also available. 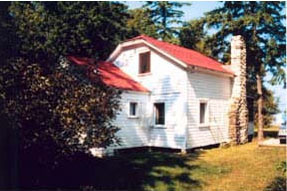 White Pine Cottage - Ephraim Fire No. 9848. Gas wall heater; bath with shower only; three second floor bedrooms, two with double bed and one with queen bed. A rollaway bed is also available. The office is at the corner of Highway 42 and Maple Grove Road. November through mid-May contact Marilee Hickey, P.O. Box 36, Walker, MN 56484; telephone 218-547-3068; e-mail mdhickey@hotmail.com or dlhickey@eot.com.